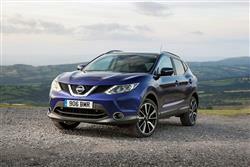 Find out everything you need to know on the new Nissan Qashqai from independent vehicle review website Car And Driving. You can watch the video review to the left to see more of the car or read their written review below to get a true insight from an expert in the automotive industry. Back in 2014, with over two million sales of its original Qashqai Crossover model on the board, Nissan went all-out to keep this second generation version ahead of an increasingly competitive chasing pack. Hence it's positioning as a bigger, classier, more practical, cleverer, quieter, better equipped and more efficient contender in the quickly growing family hatch-based family SUV market. British designed and built, this model makes a lot of sense as a used buy. Mention Nissan to most people and they'll think of a Japanese car maker. Nothing particularly remarkable. But ask industry experts about the company and they'll tell you a different story. Nissan is the manufacturer that made the most audacious gamble in recent automotive history - and it's one that paid off. The vehicle they went all-out on? This one right here, the Qashqai, a model that back in 2014, was rejuvenated in second generation guise. This version had quite an act to follow, the MK1 model having been credited with nothing less than a re-invention of its brand and the creation of the new market category we now know as the Crossover segment. Back at the original launch in 2007, the Qashqai was revolutionary, at last a new option for families shopping above the small car sector and looking for a versatile and relatively affordable runabout. People who had previously been restricted to mundanity - Focus-sized family hatches, Mondeo-style medium range models or, for the more daring, compact versions of small 4x4s or MPVs. Nissan's brilliance was in deciding to create a design that brought together elements of all these models into one sharply-styled, affordable and ever-so-desirable package. In doing so, the modern Crossover vehicle was born. Today, this class of car is something car makers launch to sell alongside their existing family hatchback and medium range contenders. Nissan, in contrast, took the much riskier step of completely replacing the models it offered in these segments with the Qashqai line-up, hoping to sell around 100,000 units a year. In the event, double that number reached global buyers and this turned out to be the most profitable vehicle in the company's history. With this replacement MK2 design, Nissan was disinclined to gamble again, so instead, this second generation Qashqai took the same qualities that made the original version such a winner in the Crossover class and refined them. It sold until the Spring of 2017 when a substantially upgraded version of this second generation model was introduced. Here though, our focus is on the 2014 to 2017-era models. When it came to the design of this second generation Qashqai, Nissan knew that it didn't need to re-invent a winning formula. So, in just the same way that a MK7 Volkswagen Golf of this era was merely a smarter evolution of its predecessor, so it is here, with a compact gym-toned shape that's 47mm longer than its predecessor but only fractionally wider. It sits a little lower too, which is surprising, for the higher-set driving position of the original MK1 version was something that women in particular said they especially liked about it. Fortunately, there's still enough high-set SUV-ness about this Nissan's appearance to satisfy most of them as part of the familiar sleek, poised stance. This MK2 model's extra length partly explains why Nissan decided not to offer a 7-seater variant as part of the second generation model line-up to replace the previous 7-seat 'Qashqai+2' model. The Japanese brand reckoned that most buyers who went for the first generation '+2' variant did so to get a larger boot rather than the extra seats, an additional luggage space requirement that this evolved Qashqai was better able to satisfy without the need for separate bodyshapes. For those who did still want seven seats, Nissan offered its pricier X-Trail SUV model. Those for whom five seats were quite sufficient took quickly to this MK2 Qashqai model though, liking the way that it was a more mature, assured-looking thing that was clearly well-engineered without having to adopt try-hard aesthetic flourishes to attract attention. The sporty looks went down well too, as did the faster, more elegant effect offered by the longer roof with its neat trailing rear spoiler, the lowered ride height and the way the bigger wheels smartly filled their arches. The design features real tension in the rear haunches, giving the effect of a car about to spring forward, while the rear features a sharp set of tail lights and a neat diffuser below the curvier bumper. Up-front, buyers were treated to a corporate Nissan V-shaped grille flowing back into a clamshell bonnet with impressively slim panel gaps, along with smart curves and swage lines. Under the skin, the sophisticated multi-link rear suspension that underpinned the original version of this car was ditched on 2WD models in favour of a simpler, lighter (and cheaper) torsion beam suspension set-up. Nissan insisted that the idea of this was to save weight, an approach that certainly worked. Thanks both to this and this model's hi-tech 'CMF' (or 'Common Module Family') platform, the second generation version of this car proved to be around 80kgs lighter than its predecessor. The cabin design was smarter, sharper and more up to date too. Nissan realised here that while customers were often seeking a touch of the Serengetti when it came to the exterior styling, tough, durable SUV-ness was less welcome to them once they got behind the wheel. So the workaday dash of the original Qashqai was jettisoned here in favour of a completely car-like interior that made much use of glossy plastic, metallic highlights and electronic toys, with all the most frequently used controls being just that little bit nicer to use than they were before. Plus it was soon clear that everything had been decently screwed together by the British Sunderland factory too. The overall result wasn't enough to give the prestige German brands any sleepless nights, but at the kind of prices being asked, that was an unreasonable expectation. The main instrument panel was a major element of this more expressive design. Visually, it was styled to expand the width of the cockpit and flows into the contoured door panels, creating a focus point at the centre for the all-important infotainment display screen and offering a cosseted feel that Nissan hoped would make passengers feel better protected. To emphasise that, the lower section of the dashboard features padded panels, along with additional pads on the centre console for the knees. The centre-dash TFT infotainment screen was provided in 5-inch form on base derivatives but on plusher models, it was delivered with the larger 7-inch screen of the NissanConnect navigation and communication system, cleverer and more informative in this MK2 model. As well as operating the usual audio, trip computer and Bluetooth 'phone functions, this set-up can tell you stuff like weather, traffic information and fuel prices plus, amongst other things, find you the most efficient route, score the green-friendliness of your driving or offer you Google 'Send-To-Car' technology so that you can plan your route on your PC before you go, then forward the instructions on to your Qashqai. Google's Point of Interest search system is also included, as well as access to things like weather forecasts, local fuel prices and flight information. Plus, if you're in a car whose original owner specified the 'Around View Monitor', this screen will display a 360-degree 'helicopter view' overhead image to simplify tight parking manoeuvres. That might be a little complicated to get your head around, but fortunately, the remainder of the cabin functions don't require an extended session with your nose buried in the vehicle handbook. The twin-dial instrument layout you view through the three-spoke leather-trimmed steering wheel is simplicity itself, with much of what you need to know delivered by a clear, classy colour TFT display set between speedo and rev counter. Practicalities have also been carefully considered, with a large glovebox and plenty of cubbies for swallowing odds and ends, with extra storage space created by the addition of an electric handbrake switch that frees up the centre console for some decently-sized cup-holders which are extra-deep so that bottles don't get in the way of your arm when you're changing gear. There are lots of lovely detail touches like that. Another, for example, is the way the centre storage box between the seats has been designed to shut properly, even when there's a wire poking into it charging up your 'phone. Not quite so good is the way that, further down, the bonnet release and fuel filler cap releases are positioned right next to each other. Most importantly, this is certainly a very comfortable place to be, something due in no small measure to the beautifully shaped seats, developed using medical scanning techniques inspired by the NASA space programme said to optimise blood flow in the lower back. We can't be quite as enthusiastic about the chairs provided for rear seat folk. These feature a lack of under-thigh support suggesting a design for kids rather than adults. Still, elsewhere in the back, the news is mostly good. Though the seats still don't slide or recline, they do offer a lot more space for your legs - nearly as much, Nissan claimed, as was provided in the old extended 'Qashqai +2' model. This MK2 design got a bit more shoulder room too, though still not quite enough to make long distance carriage of three adults an especially comfortable experience. You might have some concerns about headroom given this car's low-ish roof height but actually, it's not too bad - though can be compromised if the model you're looking at is fitted with the optional large, panoramic glass roof. Though, as you'd expect, this gives the interior a light, airy feel, it does lower the ceiling height a little. And out back? One of the other weaknesses of the original Qashqai was the restricted size of its luggage bay. Raise the tailgate and you'll find a 430-litre cargo area 20-litres bigger than the MK1 model could manage. To put that into perspective, we're talking a bit more than you get from rivals like Skoda's Yeti or Mitsubishi's ASX. But notably less than is offered by competitors like first generation versions of the Peugeot's 3008 or Mazda's CX-5. Helping the general usability of the overall boot area is the really useful luggage board system you get providing you avoid a base-trimmed model. It's made up of two reversible floor panels that can be easily raised or lowered, providing 16 possible configurations, whether your need is to slide in a mountain bike over a flat floor or prevent the contents of your weekly shopping from spreading themselves around the boot. To deal with the latter issue, you'll want to slot the board into the kind of vertical position that creates an ideal space for carrying shopping bags. The boards themselves feature a wipe-clean surface on one side and soft carpet on the other, perfect for transporting muddy boots or dirty dogs. If you do need more room, pushing forward the split-folding rear bench frees up 1,585-litres of total fresh air, far more than the previous generation model could offer. Prices for this post-2013 second generation Qashqai model start at about £9,100 for a '13-era 1.2 DIG-T model in base 'Visia' spec, rising to around £13,200 for a '17-era car. We'd find the premium of about £1,100 that's necessary to progress up to a plusher 'Acenta'-spec version. For the 'N-TEC' version with its 'NissanConnect' infotainment system, the premium is around £3,000. For top 'Tekna' spec, the premium is around £3,200. If you're a green pump buyer and can afford to look beyond that base 1.2-litre petrol engine, we'd recommend the alternative pokier 1.6 DIG-T unit. This came in from 'N-TEC' trim onwards and prices start from around £12,700 for a '14-era model, rising to around £16,800 for a later '17-era car. Not much more gets you top 'Tekna' trim. If you want diesel power, the 1.5 dCi variant is priced from around £10,100 with base 'Visia' trim from the '13-era, with values rising to around £15,000 for a later '17-era model. You're looking at a premium of around £1,100 for 'Acenta' spec and around £3,000 more for plusher 'N-TEC' or top 'Tekna' trim. As for the pokier 1.6-litre dCi 130 diesel Qashqai, prices start at around £10,500 for a model with base 'Visia' trim, with values rising to around £16,200 for a later '17-era model. Add on a premium of around £1,200 if you want a 4WD dCi 130 model. There's a premium of around £3,000 for plusher 'N-TEC' or 'Tekna' trim. Across the range, there's a premium of around £800 if you want a model with CVT auto transmission. While plenty of Qashqai owners in our survey were very happy with their cars, we also came across a surprisingly large number who'd had a whole catalogue of problems. Having reviewed these, we'll try and give you some pointers on things you might like to look out for when inspecting used examples. Early on in this MK2 design's life, Nissan issued a recall for the braking system; make sure that the car you're looking at had that done. 'Known' problems with this model relate to problems with the climate control system (it may need re-gassing) and poorly-fitted door seals. E came across a number of problems with warning lights on the dash appearing erroneously - principally a 'system fault warning' and the handbrake light. What else? Well one owner, rather distressingly, had the 1.2-litre engine of his car blow at just 7,500 miles. Another had a gearbox oil leak and still another experienced an oil leak from the timing cover in the engine which then contaminated the timing belt. One owner heard a rattle from beneath the bonnet, which turned out to be a loose airbox. One owner noticed a noise in the area of the driver's window which turned out to be down to a loose mechanism in the electric window. Another owner noticed a vibration from the engine compartment which turned out to be down to the air inlet fitting. We also came across owners who said that the autonomous emergency braking system didn't work properly in an accident situation. One buyer also had a problem with a faulty rear seatbelt catch and a seat adjustment catch that fell apart. There were also reports of sat navs freezing and fuse box covers popping out. (approx based on a 2013 Qashqai 1.5 dCi ex VAT) An air filter will be priced in the £6 to £13 bracket, an oil filter will sit in the £6 to £11 bracket, a timing belt will be in the £55 to £75 bracket and a water pump will be around £88 to £105. Brake pads are in the £12 to £26 bracket. Wiper blades cost in the £6 to £11 bracket each. A heated wing mirror glass will cost around £20-£22. If there's one thing the original MK1 Qashqai model is remembered for, it's the way that it revolutionised the dynamic responses that keen drivers could expect from a car of this kind. And in this respect, not much changed with this second generation version. In other words, if you want a Crossover model of this kind from this era, then this one remains the on-tarmac benchmark. Like all its like-minded rivals, this Nissan is aiming to offer everything people like about butch-looking SUVs in a more practical and affordable family hatch-shaped package. So you get the looks without any of the compromises you'll not want to make if you never go off road. So kerbs can be mounted, but you'll need to leave the Serengeti to Ranulph Fiennes, though at the top of the range, there is the option of 4WD for muddy carparks or snowy driveways. At the wheel, it feels like a normal family hatch in which you simply sit a bit higher. Nice - but trying to persuade a car that looks and feels like an SUV to drive like a car is no easy task. After all, conventional logic suggests that the taller you make a vehicle - and this one's about 14cm taller than a Golf or Focus-sized family hatch - the more it will roll. Still, Nissan's British Cranfield engineers clearly don't believe in conventional logic because this model manages to deliver its high stance and supple ride without taut, responsive handling becoming a casualty in the process. A truly class-leading hatch - say a Ford Focus - is still slightly better of course but it can't offer this car's wider range of attributes, which were further improved for this generation model with a number of really innovative features. Let's start with the ride quality we've just mentioned. We'd feared that this might be a causality of Nissan's cost-saving switch to a cheaper torsion beam suspension layout for this generation model, rather than the previous hi-tech multi-link rear end that in this MK2 range was limited to the pricey 4WD variant that only 5% of buyers chose. Fortunately, compensation comes in the form of a standard-fit chassis control system that uses clever double-piston dampers tuned to be as effective for high-speed highway driving as they are in soaking up bumps and potholes around town. Tarmac tears of this kind are also ironed away by a standard Active Ride control system that subtly dabs the brakes over bumps that might otherwise cause the body to pitch about. Does it work? In a word 'yes': We've not come across a better-riding Crossover from this era than this. Or a quieter one on the move. Is there a more refined affordable family car on the market than this from this era? Off the cuff, we're struggling to think of one. We certainly can't name you another Crossover that's as easy to drive fast as this Qashqai. Aiding you in this is another clever standard bit of software, the Active Trace Control system which works through the turns to counter both understeer and wheelspin by lightly micro-braking whichever front wheel is threatening to lose grip. As a result, the car's kept planted through the tightest corner and you're fired on from bend to bend. You'd perhaps be minded to attack such turns with a little more vigour if the steering was a touch more feelsome, but it is certainly an improvement over the old MK1 model, thanks to a dual-mode set-up that changes the weighting of the electrically-assisted rack when you switch from 'normal' to the 'Sport' setting. On to engines. In place of the thirsty old 1.6 and 2.0-litre powerplants foisted on the original version of this car, Nissan instead favoured MK2 model buyers with a couple of far more efficient DIG-T turbocharged units, a 150PS 1.6 and the variant that over 40% of customers chose, a 115PS 1.2. Yes, you heard right. Here, we've a two-tonne Crossover powered by an engine smaller in size than that of some citycars. And yet if you press the accelerator pedal, you'll feel generally reassured that were you asked, you'd be able to pull the skin off a rice pudding or punch your way out of a wet paper bag in this thing. Granted, it's not something you'd impress anybody with on the dragstrip at Santa Pod, but being able to get to 62mph in 11.3 seconds won't leave you worried about being caught napping in the cut and thrust of everyday motoring. If you are looking for a little more than that, then the alternative 150PS 1.6 DIG-T petrol unit ups your pulling power from 190 to 240Nm and offers rather more flexible day-to-day performance. Something you also get from the pair of dCi diesel units on offer, most customers likely to opt for the frugal 110PS 1.5-litre variant which makes 62mph in 12.4s on the way to 112mph. More pertinently for towers, this version's useful 260Nm of torque is able to boost the 1.2-litre petrol model's rather feeble 1,200kg braked trailer weight capacity to a more acceptable 1,350kgs. You'll do even better than that if you opt for the top diesel, the 130PS 1.6 dCi, which can tow a braked trailer of up to 1,800kgs in weight in manual form and, when not hitched up, can improve the 0-62mph sprint time to 10.5s and the top speed to 118mph. We should point out that you'll need to opt for this 1.6-litre dCi powerplant if you want your Qashqai fitted with either an automatic gearbox or four-wheel drive. That is an 'or' not an 'and' by the way: you can't have both, which seems a bit of a missed opportunity. The Xtronic auto transmission is one of those rubber belt-driven CVT set-ups that are often hard to drive smoothly, and raucously rev the engine when you've even the slightest need to push on. This one's far better than the norm though, more quick-witted than you'd expect, with steering wheel gearshift paddles and artificially created ratios into which the revs rise and fall as you power through the gearbox, just as you'd expect. That leaves only the ALL-MODE 4x4i all-wheel drive system, which is much the same as it was on the previous generation model. Depending on your preference, this can be set in front wheel drive, locked with drive split 50:50 to the front and rear or left in 'Auto' to shuttle torque backwards and forwards as required. It certainly doesn't make this car into any kind of off roader - there's no significant ground clearance for a start - but it'd be nice to have in a snowy snap. Building a Crossover vehicle is easy. Building one as good as this Nissan is a whole lot tougher. And it's a vehicle whose remit shifted ever so subtly in second generation form. The Qashqai couldn't fight tomorrow's battles looking quite so SUV. It needed to tone down, become sleeker and, yes, be a bit more like a conventional hatchback in look and feel. That's exactly what happened with this second generation version, a car from a brand that clearly knows its market. What didn't change in the transition from the MK1 model to this second generation design was that this, the original family Crossover model, remained the very best, a fine option for buyers not wanting to be saddled with run-of-the-mill hatches or people carriers: people not wanting the clunkiness and cost common even to smaller SUVs. Of course, by 2014, the Qashqai found itself with a much tougher set of rivals to deal with, but Nissan's product development did just enough to keep this model a step ahead of most of the chasing pack. True, this car could certainly still be a tad sharper to drive, but its handling was much improved over the previous version and the ride and refinement are genuinely impressive, aided no-doubt by the hi-tech CMF chassis. Disappointments then are few - maybe the high-ish price of 4WD and the lack of a 7-seater option this time around. But then those are issues you'll also find with most directly comparable rivals. Cars that, by and large, struggle to match up to this one. The Qashqai then, remains a benchmark. And a starting point for anyone buying in this segment.